Try our Peanut Butter Cheesecake Recipe and enjoy the cookie crust. 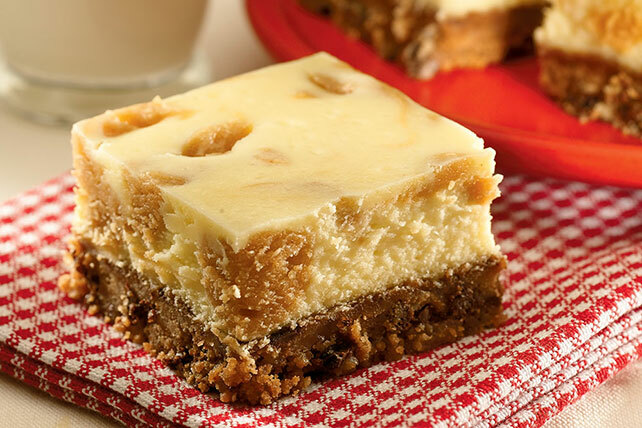 Our Peanut Butter Cheesecake Recipe is served in squares for hand-held enjoyment. Preheat oven to 350°F. Mix crumbs and margarine; press firmly onto bottom of 9-inch square baking pan. Beat cream cheese, sugar and vanilla in large bowl with electric mixer on medium speed until well blended. Add eggs, 1 at a time, mixing on low speed after each addition just until blended. Remove 1/2 cup of the batter; set aside. Spread remaining batter over crust. Stir peanut butter into reserved 1/2 cup batter. Spoon over cheesecake. Cut through batter with knife several times for marble effect. Bake 35 to 40 min. or until center is almost set. Cool completely on wire rack. Cover. Refrigerate 3 hours or overnight. Cut into 25 squares. Store in airtight container in refrigerator. Need to feed a crowd? This recipe makes enough for 25 people so is a perfect dessert to serve at your next party. For easy cleanup, line baking pan with foil using this easy method. Turn pan upside down and fit a piece of foil over top of pan, smoothing corners as needed. Remove foil. When you turn the pan over, the foil fits perfectly inside the pan.